For a clean-cutting blade that creates smooth finish cuts in material such as veneer plywood and delicate hardwood, look no further than the Freud D1280X Diablo 12-Inch Fine-Finish Saw Blade. 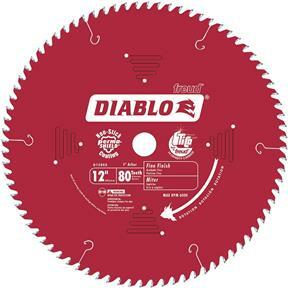 This is your go-to blade for slicing through oak, pine, melamine, veneer plywood, and delicate molding. This blade's high tooth count minimizes grabbing of the workpiece, producing cuts that require little to no sanding. For strong, long-lasting resistance, the blades feature a tough steel plate and high-density carbide tips.